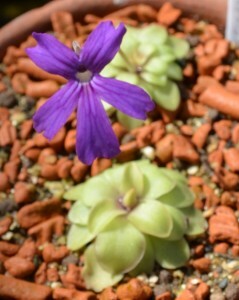 Pinguicula laueana x P. emarginata in flower only one week after travelling through the post. 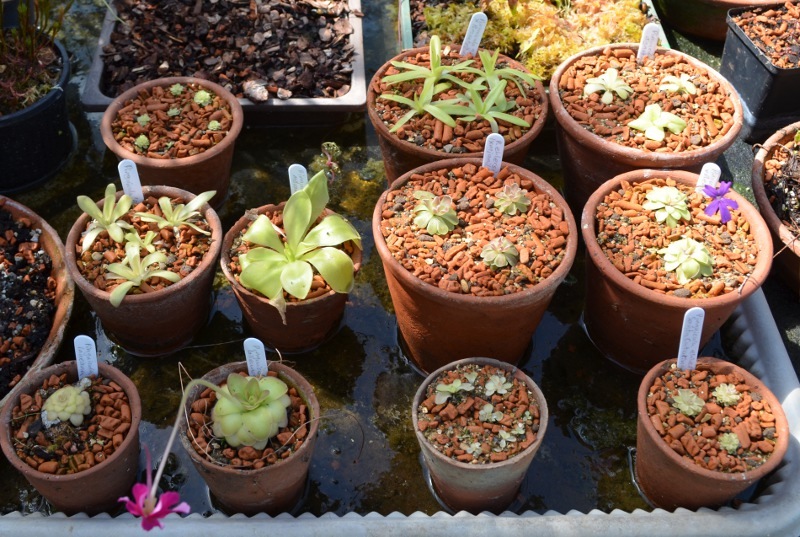 The latest arrivals to the tropical greenhouse are a set of Pinguicula species originating in Mexico and some hybrids and cultivars derived from them. These add to the plants of Pinguicula laueana we have been growing there for the past 6 months. This kind donation from Dianne Riddiford of the Carnivorous Plant Society will allow some interesting new ideas to be taught. These add to the Pinguicula laueana donated by William Purvis in 2012 when we were first setting up the greenhouse. 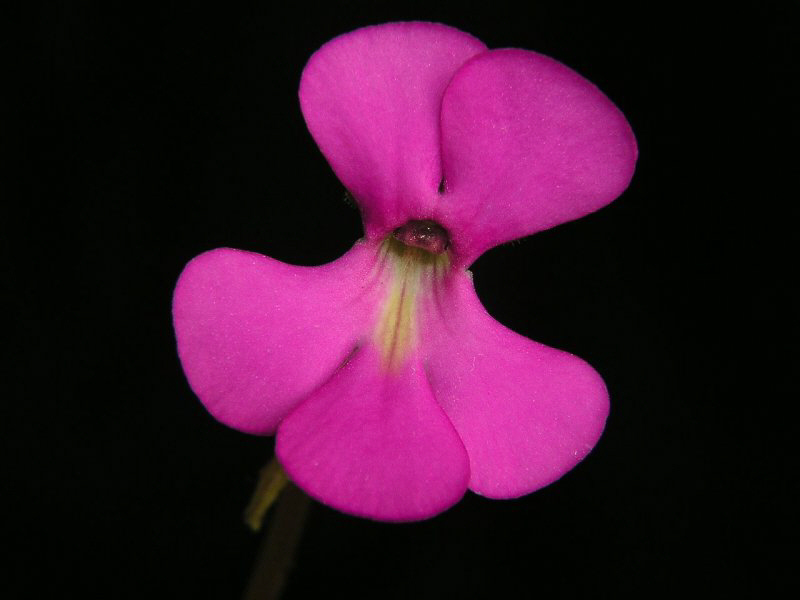 The Mexican Pinguicula species are a monophyletic group (all come from a single evolutionary origin) and have diversified in habitats that are not just unusual for Pinguicula but also for carnivorous plants in general. They are quite succulent and fleshy plants that form a tight rosette of overwintering leaves that can survive very dry conditions. Some have even been seen growing side by side with cacti. The weather in Southern Mexico, where these plants grow is warm throughout the year but the rainfall is highly seasonal. Mexican Pinguicula species planted in a mix of Seramis and clay-sand after a week settling in to their new home. The curious brick red colour of the compost is beacuse I’m using a mix of 5 parts Seramis to one part sand/loam mix. This is providing a combination of moisture and free drainage needed fro these plants. This entry was posted in Americas, Carnivorous Plants, Countries, Low Nutrient Environments, Mexico and tagged Mexican Butterwort, Pinguicula, Pinguicula agnata, Pinguicula ehlersiae (Ixmiquilpan - Hidalgo - Mexico), Pinguicula ehlersiae (Santa Catarina), Pinguicula esseriana, Pinguicula laueana, Pinguicula moranensis, Pinguicula sect. Orcheosanthus, Seramis. Bookmark the permalink.